Your Horoscope For Today's Full-Moon Lunar Eclipse, Courtesy Of Susan Miller! So, there's been a lot of talk of this "blood moon" we're having tonight and the accompanying eclipse. But, what on earth does it mean? For us? Yeah, tough to say. So, we figured it was better to ask a pro than fumble around in the, erm, dark. And, the ultimate expert on this front? Obviously Susan Miller. Read on for her explanation of what lies ahead. 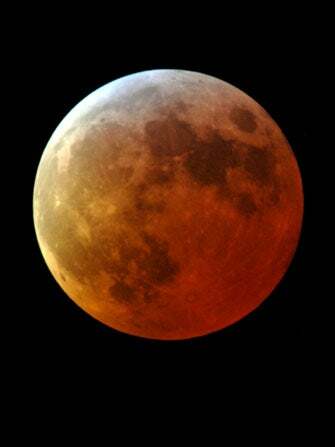 The eclipses are back, and today's is a full-moon lunar eclipse in Aries 25 degrees. Typically, we get four eclipses in a given year, but this year we will have had five, and the coming two, tonight, October 18, and then November 3, will be the last ones of 2013. 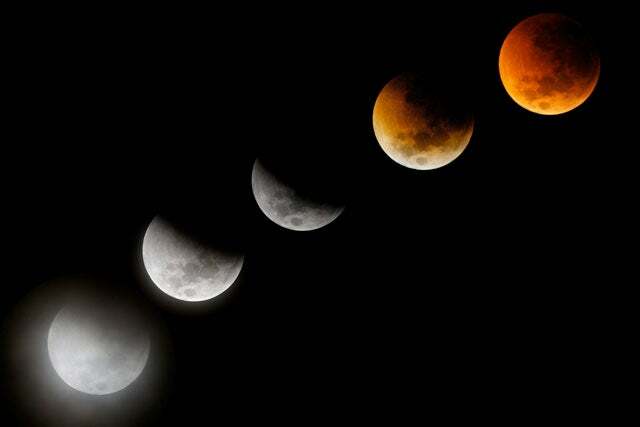 After this, the next two eclipses will arrive in April 2014. Eclipses are very powerful — they have three times the power of a normal new or full moon — and often bring big life events that we long remember. Eclipses always come in pairs, two weeks apart. While lunar eclipses, like we will have October 18, mark endings, solar eclipses, like the one we will have November 3, mark beginnings. Think about it this way: An eclipse is the most powerful tool the universe uses to affect change. It will illuminate a situation in a new way so that we view it differently. Events move on fast forward at eclipse time, but it is important not to jump to conclusions, as all eclipses have a second act. Additional information related to the topic that comes up now will be revealed later, within weeks. Be patient, and take time to reflect on all you hear. Eclipses are strict on one point: They do not allow us to return to a former situation. For example (and this is only an example), if you lose a job due to a layoff or feel you need to break up with your sweetheart, save your dignity and do not beg to keep the relationship as it has been. The bridge behind you will collapse after you walk over to the other side, and you will soon see there will be no way for you to retrace your steps — in this case and all cases, the universe is being your friend. You need to look forward, not backward, and eclipses truly make that point clear. Click through for Susan's thoughts on what this means for your sign. If you are an Aries, with a birthday that falls from April 12 to 19, the eclipse of October 18 is in your sign, so you are being singled out as having a starring role at eclipse time. You will see a matter that is dearly important to you come to culmination — it is something so personal to you that even I, as your astrologer, cannot tell you what it is, but you will know instantly when news arrives. If you find you do not get big news within five days of the October 18 eclipse, pay close attention to see if you get big news one month to the day later, specifically, November 18, plus or minus four days. (This is true for all signs — watch that date!) Aries, the eclipse may center on a certain desire you have had for a very long time that will come to closure, or the eclipse may center on a close romantic (or business) relationship. Watch and see. Lunar eclipses can be highly emotional and physically draining. This time, Mercury is about to retrograde, too. (That will happen on October 21 to November 10, but we have felt Mercury’s gremlin effects since October 1.) So, you may hear that someone important to you has changed his or her mind on a topic highly important to you. If it turns out, for example, that you do not get a position/ promotion/ special project you hoped to be awarded, be philosophical, for in this case, it may be just as well. You may not have found the right long-term situation. I say that because Mars, the ruler of the sign of this lunar eclipse (and your ruler, Aries), will be opposed to Neptune this week, so no matter which sign you happen to be (but especially Aries), you may feel confused about what you are told as a result of this eclipse. Getting to the bottom of the situation will be difficult, as not all the information will be forthcoming immediately. Neptune will fog the data, so take your time to dig for more. What you see immediately may be different from what is the truth of that situation, so reserve judgment and do your best not to make any decisions that will be etched in stone — you can do that in late November. You will need time to separate fact from fiction. If you are an Aries born April 13-19, you must protect your health. If anything feels “off,” you must see a doctor without delay. Additionally you may hear about a serious, close relationship that is important to you, and the news will be somewhat unexpected. Events or information given now at this eclipse will be directly linked to the next eclipse in the Libra-Aries series, April 15, 2014. Take note of events that happen in your life now, no matter what sign you happen to be, as you will get clues now of what will develop at a higher, more sophisticated level at that next eclipse six months from now. Eclipses always bring life events that are important to each of us if we have natal planets, the sun, or rising sign that fall close enough in mathematical degree to the eclipse. One way or another, an eclipse will help to move your life forward, ready or not! If, for example, you were not born near April 15, you may only feel this eclipse mildly. Libras with birthdays that fall on October 18, or within five days of this date, will receive news regarding a partner. You may find you are concerned about the welfare or health of a partner, or you may be upset by how you are treated by a partner. This person may be your mate, steady romantic partner, or a business partner. You may leave this person (in a breakup, for example) or help this person, say, if this person is in a life crisis and you can provide ideas, assistance, or comfort. If you are upset about the character or behavior of a partner, you may decide to work on the relationship together. There is no “fate” in astrology — you are always in charge. Capricorns with birthdays that fall within four days of January 15 may have news about your home, living arrangements, real estate, rental, roommate situation, or news concerning the welfare of a parent or another family member. If you are a Cancer, born on or near July 17, plus or minus four days, then news will center squarely on your career. Expect big shifts, possibly involving a manager who is announcing a departure, or news involving a new position that you interviewed for or a deal that you hoped to finish now. It is impossible from where I sit to tell if you will get the position you desire, or seal the deal you have worked to crystallize (or alternatively see it unravel) but I can say that you will get a final resolve to that situation. So much depends on your natal chart and how your unique natal planets relate to the eclipse, but you will know soon enough. If you are a Cancer, you may alternatively consider a residential move to take advantage of a new job. Or, you may leave a position you've been working at for a long while, or finally put the final touches on a major project before you ship it, such as on a screenplay (as one of hundreds of possible examples). If you hoped to get approval and money for a business plan, you will get the final word within days of this October 18 eclipse, or next month, on November 18 plus or minus four days. Taurus may hear of office politics going on behind the scenes. Or, Taurus may need to slow down and rest and attend to a health matter. Scorpio will need to finish a major project, and being this is an eclipse, something about this project may be important for your future. Being that the sixth house, where Scorpio is experiencing the eclipse, also rules health, it will be important to attend to all health matters now, too. Gemini and Sagittarius will host the October 18 eclipse in friendship/love sectors. Gemini may soon rub shoulders with many people in a professional community or at a club event. Something about this event will be important to your future — take note of what happens, for this event will lead you to others that are also important to you. Or, you may make an important new friend. If you meet a romantic interest at eclipse time, take your time and get to know this new, intriguing person. With Mars opposed to Neptune, you may assign lovely qualities to a person who is not quite deserving of your accolades. Go slowly. Sagittarius will come to a final conclusion about a love relationship (if dating), or concerning a child, or pregnancy. If you have a child, you may want to do something to help that child, say, by giving that child special lessons or support. Leo and Aquarius may travel under this eclipse, and if so, be sure you have proper directions, and that accommodations are still being held in place for you before you leave. If you travel for business, make sure your appointment is confirmed. Also, with Mars opposed to Neptune, ascertain that you do not lose any valuables in transit — take a moment to check that you have everything with you, as eclipses often make us rush. When you check your luggage at the airport, ask the baggage handler to be sure your suitcase is going to the correct airport. If driving, get your car tuned up. Generally, it is best not to have an overpacked schedule at eclipse time, as big events tend to come up at these times that require quick action. Having said that, I must point out that not everyone will feel this eclipse — check my website, AstrologyZone.com, for certain birthdays of various signs that will feel it. If you know your rising sign (only possible to know if you have done your natal horoscope by the precise time of birth, to the minute) then read for your rising sign too, always! This way you will get a 360-degree view of all that may get along in your life. On my website, I write a monthly column where you will get much more detailed news about the whole month and this eclipse in particular. You won’t have to wait long to find out, as the eclipse is Friday, October 18, and news will be forthcoming soon. I always say, just sit back, open the window and see what flies in. Remember to write a few notes on your calendar about the what you hear, for in several months, I will ask you to look back and check what happened in mid-October (or mid-November), for that situation will be advanced in April. Planets are always on the move, so eclipses make sure we continually see new developments!